When I was a little girl my mom spearheaded an annual Baking Campaign that started in October or November and came to a glorious, beautiful, tasty finale at Christmas. She set up a long, narrow table covered with a red tablecloth and decorated with gold tinsel. A basket shaped like a sleigh held old-fashioned, don’t-touch-it, fiberglass “snow” and some of her antique ornaments. She made a beautiful gingerbread house. There were fancy bowls of ribbon candy. But the best part was the cookies. Two shallow, rectangular baskets held rows and rows of cookies. Each row was different, and it was so exciting to be given the task of going out into the garage to the big chest freezer that held a veritable treasure trove of goodies so the baskets could be reloaded. Sometimes with even more different cookies. Sometimes I snitched. There were a few varieties that were perfectly acceptable straight out of the freezer. 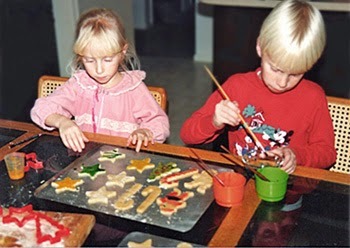 Mom—and the siblings old enough to participate in the baking frenzy—used to keep track of what cookies were made each year and how many of each. The very biggest year of all was a record 160 dozen cookies, not to mention the candies and breads that were also a part of the feast. Over the New Year’s weekend I had to bake. I found a recipe—chocolate, of course—that severely tempted my tastebuds at the same time it (mostly) catered to my desire for something easy to prepare. It’s not hard to make, but it is just a little bit involved. (Hey, if it requires more than one bowl, it’s “involved”!) I tweaked the recipe very slightly, but the original can be found at Give Recipe. Preheat oven to 320°F (160C). Grease an 8in x 8in baking pan well. Pour the milk in gradually and continue beating gently. Add the egg whites, one third at a time, and gently mix with a spatula. Pour this liquidy batter into the baking pan and bake for 60 minutes. Let it cool and when it comes to room temperature chill for an hour. Slice and dust with powdered sugar just before serving. Keep in refrigerator. My husband is not a great fan of custard, but he loved this. I love it. Make some. Tell me what you think! 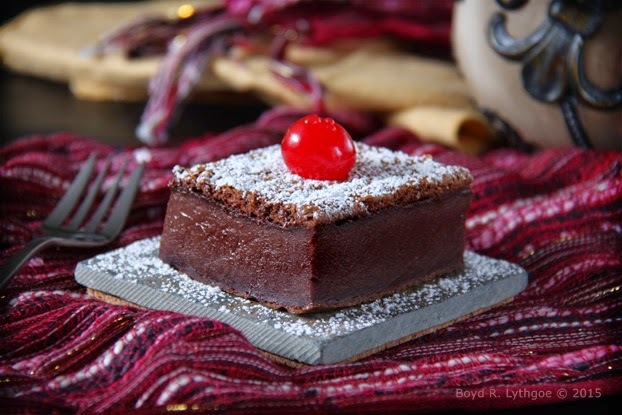 And, as always, if you have a terrific chocolate recipe to share, DO IT!